NYC, 02/06/2019, 6:00PM. 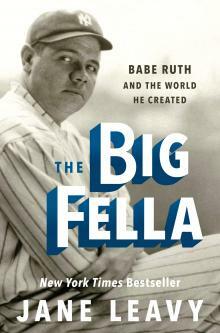 The Big Fella: Babe Ruth and the World He Created. Jane Leavy, the award-winning, bestselling author of The Last Boy and Sandy Koufax, discusses her definitive biography of Babe Ruth—the man Roger Angell dubbed "the model for modern celebrity." George Herman "Babe" Ruth Jr. (1895-1948) was an American professional baseball player whose career in Major League Baseball (MLB) spanned 22 seasons, from 1914 through 1935. Ruth established many MLB batting (and some pitching) records, including career home runs (714), runs batted in (RBIs) (2,213), bases on balls (2,062), slugging percentage (.690), and on-base plus slugging (OPS) (1.164); the latter two still stand as of 2018. Ruth is regarded as one of the greatest sports heroes in American culture and is considered by many to be the greatest baseball player of all time. In 1936, Ruth was elected into the Baseball Hall of Fame as one of its "first five" inaugural members.